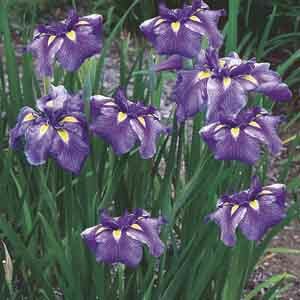 When bearded, Siberian, and Japanese iris plants become crowded and produces less flowers (every 3-5 years), it's best for their health to dig up the roots (aka rhizomes), separate, and replant them. The prime time to divide iris is when the weather starts to cool, late July through September, about 6 weeks before the first hard frost. 1. 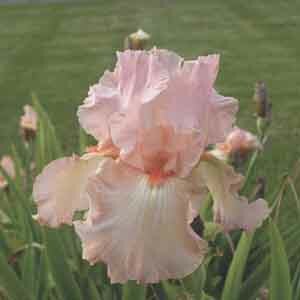 Dig and loosen the soil around the perimeter of the iris clump. Then gently lift the rhizomes from the soil with a spade or garden fork. 2. Separate the rhizomes with your hands or by cutting with a sharp knife that is dipped in a 10% bleach solution after each cut. The bleach solution prevents the spread of disease from one plant to the next. 3. Remove the soil from the rhizomes and inspect them. Keep firm rhizomes that have both roots and leaves. Discard any older rhizomes without leaves and areas affected by soft rot or iris borer (look for tell-tale holes in the rhizome). Pro-Tip: To prevent iris borer, remove and destroy the iris leaves after the first hard frost each year. 4. Trim the leaves down on an angle to about 6". 5. Prepare the new location for the iris by digging a wide, 3-5" deep hole. Set the rhizomes in the hole and cover the roots with soil. The rhizome should be slightly exposed above the soil, otherwise it may rot. 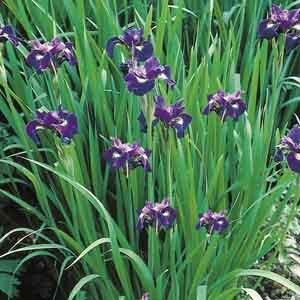 Pro-Tip: Iris plants look best when 5-7 rhizomes of each variety are grouped together. Locate the groups of each variety 18" apart. 6. Water the newly transplanted iris, but do not mulch. Mulch retains too much moisture, which can cause the rhizomes to rot.